Second on the list of English III literature is The Scarlet Letter by Nathaniel Hawthorne. Hawthorne was on good terms with transcendentalists such as Ralph Waldo Emerson and Henry David Thoreau, but was a critic of the movement himself and held more pessimistic views on human nature. An interesting fact about Hawthorne’s ancestral lineage is that he was a descendant of John Hathorne, a leading voice in the Salem Witch Trials (and a minor character in The Crucible) and one of the only judges to never apologize for his actions sentencing “witches” to death. 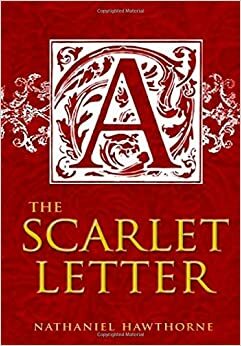 He was the reason Nathaniel Hawthorne decided to add a “w” to hide their relation, and The Scarlet Letter is seen as Hawthorne’s apology in his ancestor’s stead. The novel is set in 17th century Boston, still a largely Puritan society. In the town lives young and beautiful Hester Prynne, who in the beginning of the novel is revealed to have committed adultery and is condemned by her entire community. Her punishment is wearing a scarlet “A” on her chest for the rest of her life and become an outcast in her Puritan society. She and her daughter, Pearl, live on the outskirts of town and learn to live in their own way. These two, especially Pearl, represent non-conformists to Puritan society. However, Hester’s kindness and good works ultimately lead to some respect and higher regards for her in the community. I won’t reveal the entire storyline here, but there are two men in Hester’s complicated love life: her former husband known as Roger Chillingworth and the reverend Dimmesdale. Both are inherently non-evil people, but both suffer from pain caused by sin, guilt, or revenge. The story of these two men and Hester and Pearl in this strictly Puritan society makes this novel a fairly enjoyable and interesting read (for an English class novel at least) and serves to highlight Hawthorne’s dislike and contempt for the hypocrisy of Puritan ideals that had caused the Salem Witch Trials during his ancestor’s time.